Do you or a loved one live in a care/assisted living home? 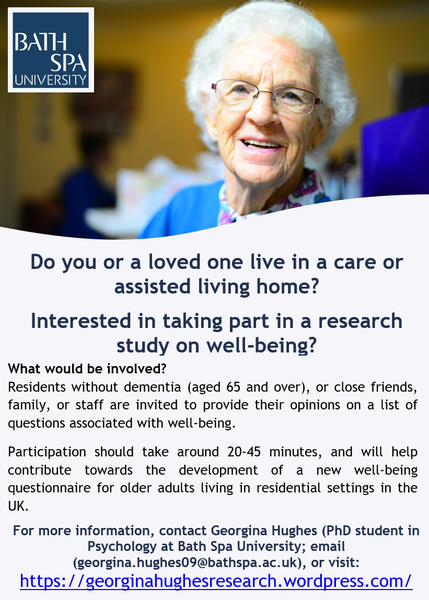 Interested in taking part in a research study on well-being? Residents without dementia (aged 65 and over), or close friends, family, or staff are invited to provide their opinions on a list of questions associated with well-being. Participation should take around 20-30 minutes, and will help contribute towards the development of a new well-being questionnaire for older adults living in residential settings in the UK. For more information please visit: georginahughesresearch.wordpress.com/ or contact Georgina Hughes (PhD student in Psychology at Bath Spa University, email: [email protected]).